Footnotes to History serves as a first reader on American government. Studies show that Americans do not understand the Constitution, the Bill of Rights, or the history behind our founding and our survival as a nation. These vignettes, standing alone or together, illustrate certain traits of the American political system. While the United States is a relatively young nation, many Americans seem to be unaware of the important traits of the American political system and of the struggles required to ensure its survival. While students of history, political professionals, and enthusiasts may enjoy reading 500-page biographies and analyses, many citizens have neither the time nor inclination to re-live the past in such detail. 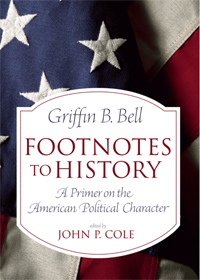 Griffin Bell, former attorney general for the United States, presents Footnotes to History: A Primer on the American Political Character as a first reader on American politics for any and all Americans. Judge Bell points to the stories of a handful of Americans—some famous, some not—to illustrate the defining characteristics of our system of government. Whether read in its entirety or a chapter or two at a time, Footnotes to History should give the reader some notion of why the American political system, in its ideals and in its reality, has served its citizens so well for over 230 years.